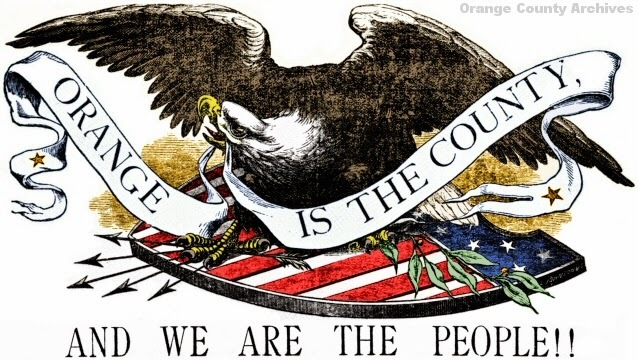 This eagle (sans color) appeared in the Santa Ana Standard in 1889, to mark county secession. Although Orange County’s birthday was last Friday, the Board of Supervisors hosted a reception this morning and had some historical presentations at their regular meeting. 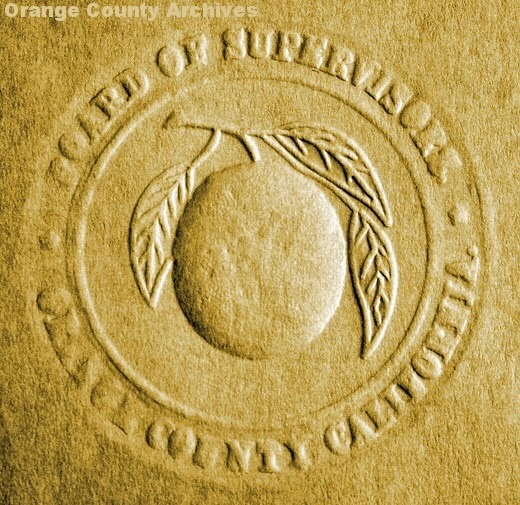 It was, after all, exactly 125 years ago today - on Aug. 5, 1889 - that the very first Orange County Board of Supervisors meeting was held. A scene from this morning's pre-meeting birthday reception. Today, Phil Brigandi gave a talk on the politics of county separation, I gave a talk about our secession and our 125 years of progress, and Supervisor John Moorlach discussed the way in which California’s counties evolved. Moorlach, who’s been the biggest proponent of the “Quasquicentennial” celebration, also presented a birthday proclamation to the rest of the board. I was graciously asked to speak at this morning's meeting by Orange County Clerk-Recorder Hugh Nguyen. Back at that first meeting, in 1889, the board met in a room above the Beatty Brothers Store, at Fourth St. and Sycamore, in Santa Ana. (I believe the Spurgeon Building now sits on that site.) It was ridiculously hot, and the men sweltered in their wool suits. That day, they arranged to buy supplies, rent office space, and have copies of relevant L.A. County assessments made. They also approved an official county seal. Supervisor Sheldon Littlefield, from Anaheim, wanted a bunch of (sour) grapes on the seal, but an orange with three leaves won out. The chosen county seal design did not honor Anaheim's vintners. Today’s event, by contrast, was delightfully well air-conditioned, dealt with the sorts of issues you'd expect in a county of 3.1 million residents, and was run as if they'd had 125 years of practice. I was glad to have been asked to be a small part of it. Watch for more “OC125” events in September and October. The OC fire services has some interesting beginings and many changes over the years. We have saved the early records of the Orange County Fire Dept. We are trying to put togather a complete history of the fire services in the OC. We are building a fire museum at the OC Great Park which will house a fire service library and history archives. Happy 125th Birthday, Orange County!